Shampoos are a product that we use often in our every day life, not only to cleanse our hair but to take care of our hair making it healthy, shiny and beautiful. However most shampoos have artificial colors, chemical fragrances, silicones, detergents, chemical additives which are harsh and unfriendly to our hair and scalp. 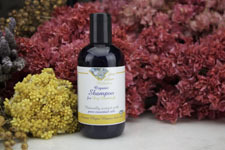 Our Organic Shampoos are unlike any other Shampoos that you may have tried. What makes ours so different? We blend our Shampoos to specific hair types, by using Essential Oils that address specific issues, in the truest sense of Aromatherapy. Most just add fragrances or essential oils but mainly for the effect of scent, by using essential oils that specifically address hair types or problems with scalp and hair we find that the results are outstanding. You get the benefit of the scenting of course but now the essential oils are actually treating your hair and scalp. We further improve all this by using Homeopathic Solutions which make the Shampoos alive with energy and this is something that you'll notice right away. You'll feel better your hair will feel like it's never felt before and you'll notice the shampoo does not build up nor does it irritate the scalp it's like this union was meant to be and we think it is. Our test marketing has shown us that we're on the right course as customers come back raving about how their hair looks and feels and most important they come back for more! Our shampoos have been created utilizing our knowledge and our philosophy resulting in the following products. 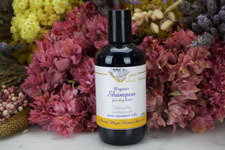 SLS free and free of parabens.